1. Cut a 5 5/8” square piece of the blue text patterned paper from the Me to You Pack, add double sided tape to the back and mat onto slightly larger square of red paper from the pack. 2. Using white card blank from 6x6 pack, place with fold at the top and attach previously matted papers to the front using double sided tape. 3. Take red A7 mini card from pack, glue layer 1 of decoupage to the front and add layer 2 on top using 3D foam pads to give height. Glue Warm Wishes greeting from decoupage pad to inside of red mini card. Add completed mini card to main card front at an angle by using a dab of glue at the back. 4. Take two lengths of twine hold together and tie a loop at one end, slip twine inside to ‘string’ the mini card, tie a loop at other end, add glue to the back of the knotted loops and stick to card front, trim ends of twin when dry. 5. Take two of the Me to You printed mini pegs and clip one to each side of the mini card to look like they are holding it in place. Top Tip: Remember you don’t always have to use every layer when assembling decoupage, this card uses just 1 layer added to the base layer which not only saves time when batch making but you can also use the remaining layers on other projects too. Dovecraft Glad Tidings 8x8 paper, Wooden Frames, Sequins, Blossoms, Mini Bows, Metal Charms, pearls and stickers. 2. Take 3 pieces of Glad Tidings papers and trim each one with a couple of millimetres of each edge and distress the edges, slice a piece of the background paper a couple of inches wide and apply it to the centre of your last piece of paper and tuck the edges round and behind the top sheet of paper and stick them all down on top of each other. 3. Take paper flowers and add silver glitter glue around each flower, pop a sequin to each centre you can apply this after you have stuck your flowers down. 4. Stick down your picture frame at an angle and place your flowers in an arrangement in the centre and over the side of the picture frame. Add pearls to the corners of your frame. 5. Stick down a brass metal snowflake charm on top of the flowers and finish off with a spotty bow. Add small stick on pearls to the snowflakes on the paper background. 6. Add your glitter sentiment and Christmas tag stickers; tuck them behind your belly band. Top Tip: Don’t think of Christmas as just being traditional, and that you have to use Santa, Trees and Snowmen all time. Think about films, books, and the season’s colours for inspiration this will open your mind to new ideas. There is nothing to stop you making themed Christmas cards and gifts, that are completely different to anyone else. 1. Tear off the edges of a sheet of patterned paper along a ruler to create an approximately 14cm square. Roll the edges over a pencil or the handle of a brush and add some tears. Position on the card blank at an angle. 2. Assemble the layers 1 to 4 of the Teddy decoupage image. 3. Arrange the decoupage image together with a wooden shape on the card. 4. Finish off by adding star-shaped gems as shown. Top Tip: This is a super quick card that does not even require scissors or a paper trimmer perfect for making on bulk this Christmas. 1. Take a piece of A4 Kraft Card and cut to measure: 11” long x 4 ¼” wide. Along the 11” edge, score the card at 5 ½”. Cut at 9 ½” first then @ 7 ½”. Fold the card at the score line and burnish with the bone folder. 2. For the Vertical Aperture, trim the 2” x 4 ¼” piece of card that once removed forms the void to measure 2” x 4”. 4. Take a piece of white A4 Card and cut to 5 ¼” long x 4” wide and adhere to inside of card. 5. Place the Vertical Aperture on the front of the card bridging the two horizontal pieces. 6. In the space to the right of the Vertical Aperture on the inside of the card Stamp “Have a Wonderful Christmas” and decorate with buttons. 7. Take the oval Glitter Sticker Tag, add a Red Twine bow and thread 3 jingle bells onto twine, thread through the tag hole and glue to the back, add the green and red bell stickers under where the jingle bells hang. Fix to the vertical aperture. Top Tip: I think you will agree this is a quick and easy card shape to make and decorate in so many different ways, it’s a great way to use up all your embellishments and no card will be the same. 5. Stamp out sentiment onto paper, cut out and place on the card on the right hand edge is in the centre of the gilded flower, add a diamante charm on top. 6. Finish off with a few silver sequins in the top right and bottom left hand corner. Top Tip: Create a production line when making Christmas cards you will find it much easier to make them in bulk, keep the design simple and stylish to save time. 1. Trim a piece of green snowflake paper to 17cm x 12cm and add to the front of a kraft card blank. 2. Trim a piece of stripy paper to 15cm x 7cm and cut a fishtail at one end. 3. Mat onto a piece of kraft card and stick towards the bottom left hand side of the card. 4. Make up the decoupage, mat onto kraft card and add at a jaunty angle onto the card. 5. Stick a wooden snowflake on the bottom right hand side of the card and top with a mini bow. 6. Add a fabric sentiment to the top right hand side of the decoupage image. Finish off with 3 gems in the top right corner. 1. Cut a piece of the green paper 15cm x 15cm, mat and layer with a piece of 14.5 cm square backing paper. Adhere to the card blank. 2. Cut a 12.5 cm square piece of backing paper and mat and layer with a 12cm square and adhere to the card blank at an angle. 3. Cut a strip of green backing paper 15cm x 7cm mat and layer with a piece of 14.5 x 6.5 cm strip of baking paper. 4. Cut the medallion shape out of the 12 x 12 pad and the Merry and Bright bauble. 5. Adhere the medallion to the card using foam pads to add dimension. Add some twine to the top of the bauble, and then adhere it to the medallion with foam pads. 6. Add some gems to the corner to finish the card. Top Tip; When cutting elements from the backing papers to use as toppers, run them through your die cutting machine. This helps to flatten the cut edges and give a neater finish. 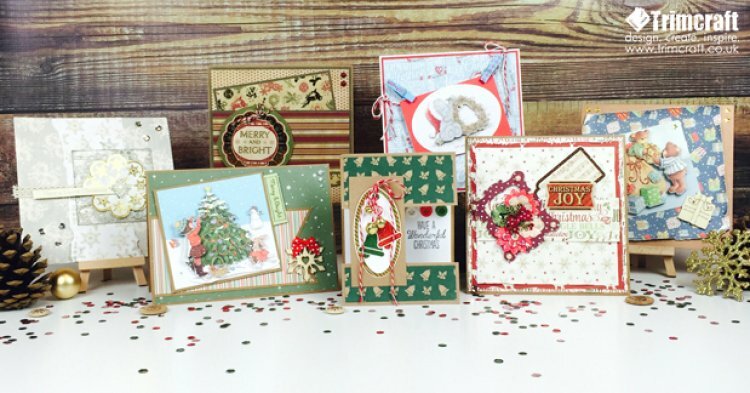 With something for everyone you can’t go wrong with the beautiful Christmas collections from Trimcraft, which card is your favourite? Let us know below and we look forward to seeing your festive projects in the gallery soon!